ARE SHUTTERS A NEW IDEA? No. Shutters have been around longer than windows and originated in ancient Greece. They have been used throughout the Mediterranean for thousands of years and spread to the rest of Europe in Medieval times. The term 'plantation shutters' originates from the cotton plantations in America's south which absorbed the tradition of shutters from Spanish colonies in the Caribbean. Australia used shutters from the time of first European settlement with fixed blades to limit sunlight infiltration and provide security protection to all external door and window openings. WHAT TYPES OF SHUTTERS DOES WOODWORKERS SELL? Are primarily intended for internal use as an alternative to curtains or blinds. They provide privacy and light control. Versions of plantation shutters exist that can be used externally. Have been used since Colonial times on the outside of windows and doors to provide privacy, security and limit the infiltration of light. They are commonly used in tropical houses to lock up the building perimeter while allowing air to circulate throughout the house at night. Louvre galleries are intended for external use and can either carry glass or timber blades that are fully adjustable. They are intended for high exposure areas to provide controlled ventilation and privacy. Are commonly used as cupboard doors internally and may either be ventilating or non-ventilating. They are constructed differently to fixed blade storm shutters, being thinner and less robust. DO YOU MAKE EVERYTHING IN AUSTRALIA? No. Storm shutters, adjustable louvres and fixed louvres are made locally but plantation shutters are made overseas due to the high labour content of fully finished product. Lead times for plantation shutters however are usually 6 - 8 weeks, which may be greater than our usual local production times. DO IMPORTED PLANTATION SHUTTERS COME WITH A WARRANTY? Yes, all our internal shutters come with a full three year warranty. There is no fine print or call out fees. Like any timber product, if it has gone through three summers and three winters and not moved, it will probably be trouble free for a lifetime. Shutters are like any window treatment; the better maintained, the greater the longevity. Normal dusting is the main thing and every 3 to 6 months give them a wipe over with a good quality oil or wax based furniture polish. If your shutters get wet, dry them off as soon as possible before the full sun gets on the them. WHAT ARE THE BENEFITS OF PLANTATION SHUTTERS OVER OTHER WINDOW FURNISHINGS? Plantation Shutters look great and have many practical advantages over other window furnishings. Having a horizontal louvre makes it is easy to control light and privacy. Plantation shutters block out 90% of light when closed and the frame of a shutter prevents movement so there is no rattling or moving in the wind. Plantation Shutters can be hinged, bi-folding or sliding to give more versatility with light and privacy control. Plantation Shutters add real value to your home and may be able to be recoated if you change your decor later. Compared to the alternatives, plantation shutters are a practical long term solution. Roller blinds for example, are either up or down and when down they block air flow. Sheer fabric curtains offer no privacy at night and can billow and tear easily. Venetians rattle in the wind. Shutters however offer full control of light and air flow without any noise. They also offer a good architectural line to the window or door with easy maintenance. Shutters can be made for all types of windows and doors. We would normally duplicate the window or door you want to cover. For instance, if it is a triple casement window we would put 3 shutters to match the casements; if it is a sliding door then we would put sliding shutters to match. However in some cases we may use bi-folding or fixed as the application may be dictated by furniture layout or accessibility. Woodworkers always hinge, slide or bi-fold shutters so you can get to the window or door. This varies according to the time of year but generally five to six weeks. When the factory is quiet faster lead times can be achieved. Always talk to us if you are in a hurry and we can see where the factory is up to. DO YOU INSTALL PLANTATION SHUTTERS? Yes. We have trained and experienced shutter installers who check measure your opening and install the shutters when manufacturing is complete. CAN I MATCH MY CEDAR JOINERY WITH SHUTTERS? Yes. Woodworkers doors and windows are made using Surian Cedar. Woodworkers are the foremost supplier of surian plantation shutters that match your joinery. Other suppliers may try to sell you western red cedar shutters that will look different from your doors and windows as western red cedar has a very different colour and grain structure. Woodworkers also supplies wood grain aluminium shutters that match surian timber for external applications. ARE ALL PLANTATION SHUTTERS THE SAME? Ecotimba (for painted applications only) Constructed from laminated engineered strips of plantation grown fir coated in venetian plaster and nitrocellulose paint. Inherently strong and stable, suitable for larger span applications where a budget solution is required. Suitable for high moisture and exposure applications with durable powder coat finishes being available in colours or photo imaged timber grain. Basswood (Tilia Americana) is a plantation grown light coloured, even grained hardwood. Its consistency of colour makes it ideal for stained applications or painting. Surian Cedar (Toona Ciliata) Among the most beautiful natural timbers because of its superb colour and grain. It is ideal for clear finished applications in protected situations and will match surian cedar external joinery. ARE THE PAINTED SHUTTERS CHEAPER THAN CLEAR FINISHED TIMBER? Yes. Painted shutters usually cost less than transparent timber finishes. This is a result of the timber used in the shutter. For a timber look we mostly use premium timbers suitable for staining whereas for the painted finishes we can use a engineered laminated timbers as the grain is not seen. CAN I PUT SHUTTERS IN THE BATHROOM? You can put any of the shutters in the bathroom provided they are not going to be getting a lot of water on them. If it is above a spa or in a shower area and going to be getting wet regularly, it is best to use an aluminium shutter. CAN PLANTATION SHUTTERS BE USED EXTERNALLY? Plantation shutters have a weak point where the blade pivots on the stile. In timber shutters it is unlikely that this connection will last very long when exposed to full weather. Various shutter retailers sell plantation shutters in Western Red Cedar for external use, sometimes even carrying a one year warranty but the reality is that they will deteriorate over time. A better solution is to use aluminium shutters for this purpose, where their inherent strength and low maintenance makes them ideal. Photo imaged timber grain finishes are available on aluminium that are suitable for external exposure (should a timber look be required) as well as a selection of powdercoated colour options. Another alternative is to use timber or metal galleries that are adjustable, lockable and engineered for external use. These provide the look of plantation shutters but may be less expensive and more durable. We offer 2 types of finishes: paint and stain. We can offer a selection of 6 standard colours to choose from in our ecotimba shutter and 10 standard colours in our Basswood shutter with an option of a custom colour at a small extra cost. In the Basswood range we can also offer a range of timber stain colours, using a fade resistant stain with a clear lacquer finish including a UV filter for longevity of the shutter. Our surian shutters come clear finished as standard but can be stained. HOW IS EACH SHUTTER PANEL DESIGNED? The tension screw visible on both sides of each shutter panel allows the tension to be tightened or loosened to ensure that shutters do not begin to flop over time. 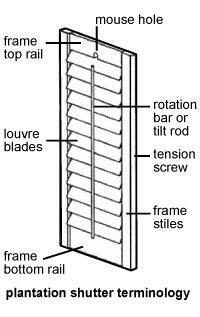 A Phillips head screw driver allows tension adjustment to keep louvre blades taut but not excessively tight. ARE THERE ROTATION BAR OPTIONS? where the bar is set to the left or the right of the blades, usually away from the centre of the opening. This works well on large openings to keep the centre clear. where the bar is at the back of the blades. In this instance you move any one blade with your hand and it moves all the other blades. This gives a more modern look and gives a clear view. Clear view shutters do not however close as accurately as rotatiton bar shutters. WHAT DIFFERENT BLADE SIZES ARE AVAILABLE? There are a three different sizes of basswood aerofoil blades, 63mm, 89mm and 114mm but the ecotimber range only has 63 and 89mm blades available. Our stock shutters come with an 89mm aerofoil blade as this works best in most windows as it is easy to look through and is not too intrusive into the room. WHAT SPACE DO I NEED IN THE WINDOW REVEALS TO ACCOMODATE SHUTTERS? That depends on the blade size you choose. To allow for the blades to rotate you will require 55mm clear space for a 63mm blade and 65mm for an 89mm blade. 114mm louvre blade needs approximately 78mm clear space. Clear space means no obstructions like mullions, fins, handles, locks and keys. ARE SHUTTERS HINGED DIRECTLY TO MY EXISTING REVEALS? Shutters can be supplied as panels only to be fixed to existing reveals, or supplied pre hung in their own frames that are installed within the existing reveals. The problem with supplying loose shutter panels that are fully finished is that they cannot be shaved down if the opening is out of square. If the panels are fabricated smaller, they tend to highlight any uneven gap when installed in the opening. This style of installation is called direct mount and often will require a light block installed behind the shutter and an astragal or mushroom stop between panels to conceal uneven clearances in the opening. 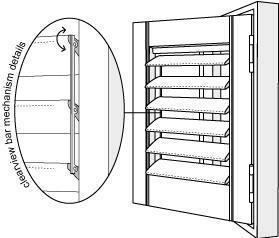 It is therefore more common in the shutter industry to supply a prefinished prehung unit that has its own frame that can be recessed within openings and independently squared up regardless of the shape of the host frame. These frames are supplied with up to a 4mm tolerance to allow for easy installation. Any gaps are then filled with an appropriate gap filler. WHAT STYLES OF SURROUND FRAME ARE AVAILABLE? Used where hardware obstructs the installation of shutters to set the panels clear of the opening. The vintage L frame has a removable face cover to conceal fixing screws and is recommended for installing shaped windows like arches, portholes and raked heads as this will give you a perfect shape and covers any irregularities in the window. We carry a limited range of stock shutters suitable for our stock joinery doors and windows which are highly affordable. Stock shutters use 89mm aerofoil blades with a traditional centre rotation bar. Woodworkers also can arrange installation on site if required. Stock shutters are made in sizes to be jamb fixed to Woodworkers stock joinery frames and do not come with architrave/catches or hinges. Depending on the style of window or door on which they are to be fixed, the timber stops may need to be modified to accommodate the shutters. Depending on the sill size used with stock joinery stock shutters may also need to be sized down to fit e.g. Casement window shutters will need to have 35mm trimmed from their height, compared to the same sized double hung window. The top rail of stock shutters is designed to accommodate this amount of trim. Stock shutters may be hung on jambs using hirline hinges which can be supplied separately. Where double or multiple shutter arrangements are required, the side stile of stock shutters needsd to be trimmed by up to 10mm and a mushroom stop installed to cover the raw edge. Woodworkers can offer a customization service for the stock shutters so they will be suitable for other applications as required. If you know what you are doing then yes. Once the shutters have been measured right they are easy to install. If you are looking to install one of our shutter kits on a window or door be sure to read all the small print on the leaflet to get the exact measurements and talk to our shutter expert. We offer an installation service but only on openings we have measured. If you want to measure your own window talk to us if you are not sure how the shutters will fit. CAN YOU MAKE SHUTTERS FOR UNUSUAL SHAPE OPENINGS? Yes. Plantation shutters can be fabricated to almost any shape provided an accurate template is obtained. As shaped panels are a specialty item and individually handmade, they are more expensive than normal shutters. WHAT IS THE DIFFERENCE BETWEEN STORM AND PLANTATION SHUTTERS? Storm shutters have fixed blades robustly built to withstand heavy weather. Plantation shutters are lightweight adjustable shutters primarily for use internally. WHAT IS THE PRACTICAL USE OF STORM SHUTTERS? Throughout the nineteenth century, louvred storm shutters were used to block sunlight, enhance security and allow for the night ventilation of houses. Full height shutters hung on parliament hinges often screened french doors or were fixed in roof gables to ventilate roof spaces. The Woodworkers Company makes fixed louvre storm shutters to any size or design (with or without insect screening) to complement house joinery and restore authentic style. HOW ARE STORM SHUTTERS CONSTRUCTED? Woodworkers manufactures storm shutters using traditional mortise and tenon joinery construction 40mm thick. The fixed blades are slotted into lasercut side galleries to ensure pinpoint accurate alignment. The louvres do not project beyond the face of the joinery, which makes them easier for fixing insect screening if required. Storm shutters use more timber than almost any other joinery item so they are relatively expensive. They are generally manufactured using Surian Cedar frame and blades for durable external performance. CAN WOODWORKERS MATCH EXISTING STORM SHUTTERS? Yes. Traditionally shutters were constructed with angled trenches cut into the side stiles of joinery and the blades protruded forward from the face of the sash. These details can be copied but the process is labour intensive, more expensive and less accurate than our standard fabrication methods. WHAT SIZE RESTRICTIONS APPLY TO STORM SHUTTERS? Where large units are required it is usually necessary to run lasercut stabilising mullions at approximately 500mm centres to restrict twist in the blades. Unfortunately, any slight misalignment, twist or bow in the louvres is accentuated by the parallel pattern of shutters. Woodworker's unique storm shutter construction allows this problem to be restricted so that large shutters sometimes exceeding more than 2 metres in width can be manufactured. WHAT TYPES OF FIXES BLADE SHUTTERS DO YOU MAKE? Woodworkers manufacture fixed blade slotted shutters in 32mm and 40mm thickness. The blade size is 38 x 10 for 40mm doors and 31 x 6 for 32mm blades. Door construction is usually mortice and tenon but fixed blade shutters are not recommended for unprotected external locations as the blades are relatively thin and less durable. Most slotted louvre doors are manufactured in red cedar but other species can be fabricated to quotation. I NEED ADJUSTABLE SHUTTERS EXTERNALLY. ARE ALUMINIUM PLANTATION SHUTTERS MY ONLY LONG TERM SOLUTION? No. Adjustable louvre galleries also provide the look of plantation shutters but are fully engineered to withstand all weather conditions. WHAT ARE THE ADVANTAGES OF LOUVRE GALLERIES?